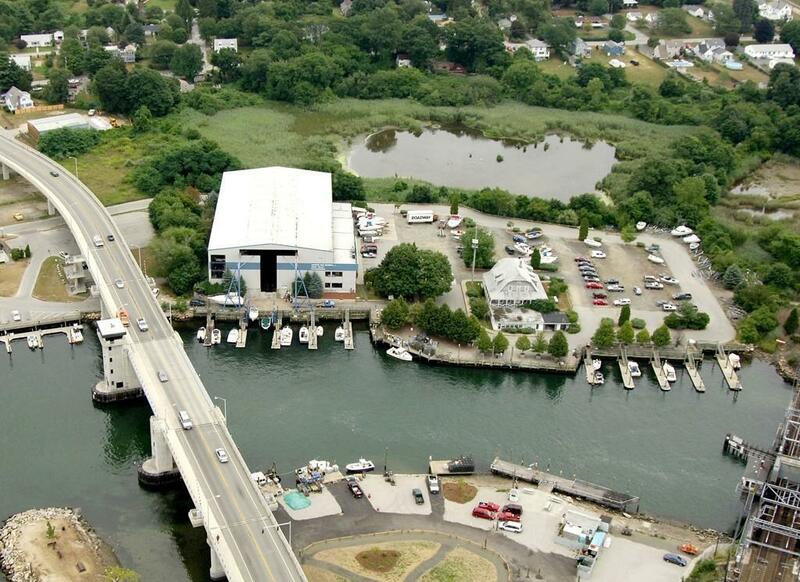 Fully Equipped Facility Selling Turnkey k/a "Niantic Bay Boat Valet Marina on 3.9+/- Acres on Mago Point; Boat storage, crane/launch system, service area, fueling station, marina store & more; RE Tax Appraisal: $2,479,030 (real estate only); Zoning: MPD Mago Point District; Building: Recently repainted 35,239+/- sf. GBA pre-engineered metal warehouse built on concrete slab in 1989 with 28,882+/- sf. 1st fl., 3,654+/- sf. office, 1,769+/- sf. garage, 690+/- sf. warehouse, 119+/- sf. attached shed, 125+/- sf. deck & patio area per Assessor; Parking: Ample, includes shared 12 River St. lot leased through 2040. High visibility location next to Rt. 156 on east bank of the Niantic River, providing quick access to Block Island & Long Island Sounds by way of Niantic Bay. Close to golf, beaches, Routes I-95 & I-395 all within 15+/- mi. of Groton Naval Base, Mystic attractions & Mohegan Sun Casino.